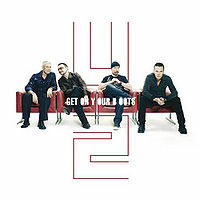 Get On Your Boots was the lead single off No Line on the Horizon, perhaps an odd first single release, it grew on many listeners with a few listeners. It's kind of like a crazy cousin on Beautiful Day from the Achtung Baby side of the family. The lyrics are supposedly written from the perspective of a man writing to his first love as he relates how he is taking his family to a fairground in Nice, France at the beginning of the Iraq War. Bono also references the wider spectre of war and perhaps knowingly says he doesn't want to talk about war but saying that he actually is. Other songs from No Line on the Horizon that refer to the theatre of war include White as Snow and Cedars of Lebanon. The refrain 'let me in the sound' is also referenced in 'Fez Being Born'. Check out some more U2 Lyrics from No Line on the Horizon. This was a totally random first single? Should have gone with the Crazy Tonight song first methinks....then followed up with Boots, then magnificant. What do you think?